The Pink Patch Project is an innovative public awareness campaign designed to bring attention to the fight against breast cancer. It centers on the vibrant pink versions of the public safety officer’s uniform patch. These bright pink patches have been specially designed by the Lake Forest Park Police Department. Officers will wear them during October, in recognition of Breast Cancer Awareness Month. Pink patches and pink ribbon pins are available for purchase at the LFP Police Department while supplies last: the patch is $10, pins are $5. 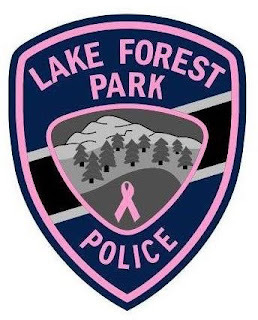 Your purchase of Lake Forest Park Pink Patches helps support Cancer Lifeline, a local organization that delivers a vast array of services to cancer victims, cancer survivors, and their families. Checks should be made out directly to Cancer Lifeline; cash is also accepted. Please take a moment to remember those we have lost and support those fighting the battle. More information about Cancer Lifeline.